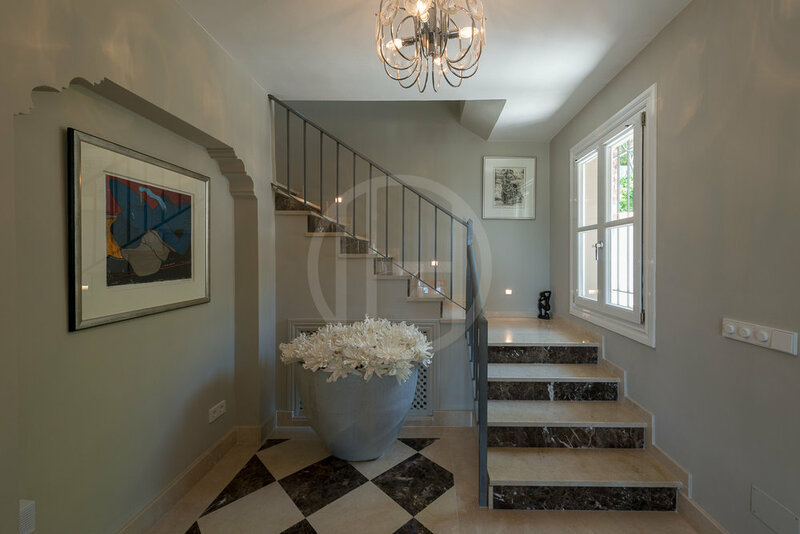 Wonderful Spanish villa with traditional Andalusian design with timeless details and modern amenities. This gated property consists of a main house and a guest house – and is located on an elevated position within El Madroñal, bordering the award-winning picturesque urbanization La Heredia with its convenient amenities including the best butcher on the coast, a lovely bakery, a small supermarket, bar and the excellent restaurant La Casita. 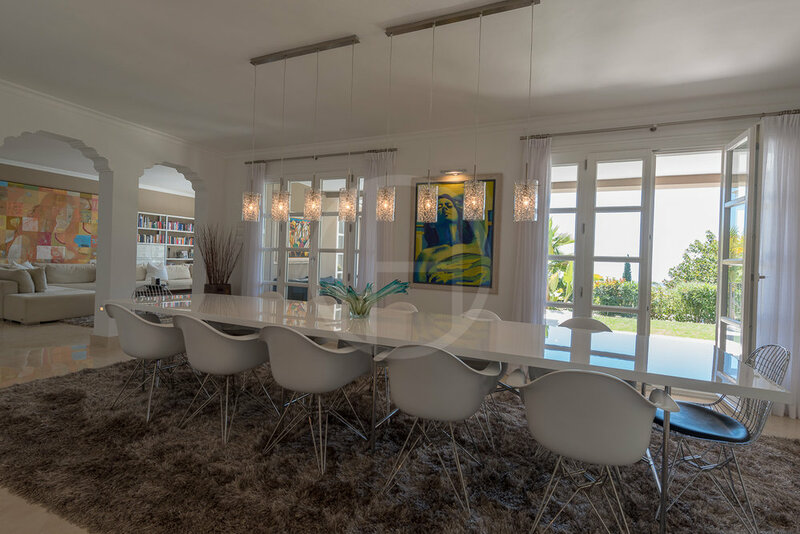 The property has been completely renovated and upgraded 2010/2011, where modern luxurious comforts and quality are well complementing its original classic style. Renovations include: new roofs, new marble window sills, new driveway with subterranean drainage system, special water-proofed terraces, and a ventilation system throughout the villa. The entrance level enjoys a beautiful patio style entrance and consists of an fully equipped kitchen, a grand dining area, and spectacular living room with fireplace and a guest WC. Charming covered terraces includes an outside kitchen and dining area – and a private lounge corner with views of the garden, pool and coastline in the distance. 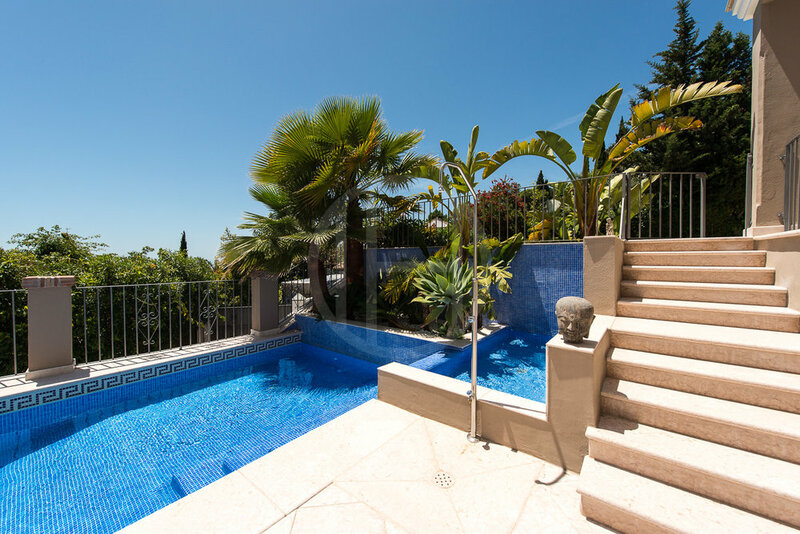 The upper floor boasts 2 large, private sun terraces, and 4 bedrooms – including a majestic Master suite with a magnificent bathroom and stunning views to the Med and Africa. There is also a self contained guest house – ideal for guests or live-in staff. Two pristine, newly tiled, double garages each include extra space for storage and thereby could also serve as an atelier or studio. One offers access to the newly constructed wine cellar, which could also double as a secure storage facility. The property is in a general excellent condition and is only a short drive away from all amenities and several top golf courses.